Contrary to recent statements by top Russian officials, the Indo-Russian stealth fighter project remains stuck. The co-development and production of the Sukhoi/HAL Fifth Generation Fighter Aircraft (FGFA), also known in India as the Perspective Multi-role Fighter (PMF), one of the most high profile joint Indo-Russian defense projects remains stuck despite recent comments by a senior Russian official that a final contract may be signed soon. Russian officials have time and again expressed similar sentiments about the imminent conclusion of a final contract for the past three years with little to show. India and Russia originally signed an inter-governmental agreement for the project in 2007, which was followed by the inking of a design contract for the co-development of the FGFA/PMF in 2010. Issues immediately arose over what technologies should to be used for the new aircraft and both sides also failed to agree to a work and cost sharing plan. Delays were caused by New Delhi and Moscow disagreeing over many fundamental aspects of the joint development project including work and cost share, aircraft technology, as well as the number of aircraft to be ordered. After evaluating the first PAK FA T-50 prototype (the Russian prototype of the PMF), the Indian Air Force (IAF) wanted more than 40 changes addressing, among other things, perceived weaknesses in the plane’s engine, stealth, and weapon-carrying capabilities. India held out however. Nevertheless, a panel instated by the Indian Ministry of Defense, headed by retired Air Marshal Simhakutty Varthaman, purportedly recommended in August 2017 that the project, despite its high cost, proceed. Frustrated with the delays, the IAF has repeatedly expressed its desire to end collaboration on the joint Indo-Russian stealth fighter project. India has reportedly withdrawn from a 11-year joint program to develop a 5th generation fighter jet with Russia. 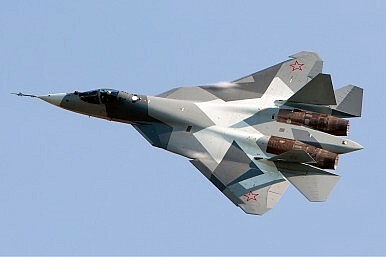 India Wants Out of 5th Generation Fighter Jet Program With RussiaIndia Should Co-Produce Stealth Fighter With Russia, Defense Ministry Panel SaysIndia, Russia 5th Generation Fighter Jet Deal is 'Lost'India, Russia 5th Generation Fighter Jet Deal to Be Signed ‘Soon’Will India, Russia Co-Develop a New 5th Generation Stealth Fighter?